AlphaNinja - "Great Success!" That said, the 1.96% required yield was still 50basis points higher than the May5th auction at 1.437% - investors know our situation in the US is declining, so they demand more yield. June 9 (Bloomberg) -- Treasury notes maturing in five years and less gained as yields near a seven-month high helped spur investor demand at the government’s record-tying auction of $35 billion of three-year securities. Ten- and 30-year debt fell as traders prepared for the sale of an additional $30 billion in new securities in the next two days. 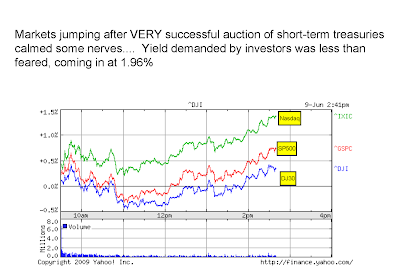 Today’s sale drew a yield of 1.960 percent, lower than forecast in a Bloomberg News survey."